On the 23nd November, 2013 eleven former members of the 37th Cadet Class of the Defence Forces, that formed a Guard of Honour at the graveside of President John F. Kennedy in Washington in 1963, will travel to Washington to commemorate the event. They will be accompanied by a colour party of an officer, five cadets and a piper. A number of spouses of the former cadets will also travel. At a brief ceremony the party will lay a wreath at President Kennedy’s grave on Monday the 25th November and also at the Tomb of the Unknowns in Arlington Cemetery, Washington. The Irish Ambassador to the United States will be present at the ceremony and will host a reception later that day in the Embassy. 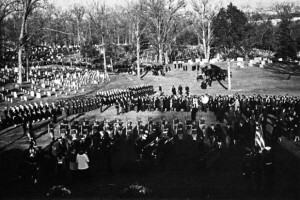 In 1963, at the request of Mrs Jacqueline Kennedy, 26 cadets stationed at the time in the Military College, Curragh, County Kildare flew to Washington with President de Valera (who was representing the State at the funeral) to perform funeral drill at the graveside of the assassinated President. President Kennedy had witnessed the same funeral drill by members of the 36th Cadet Class at Arbour Hill during his visit to Ireland some months previously. Prior to the wreath laying, the travelling group will assemble in Fort Myer, where the cadets were accommodated in 1963, and will present a replica of the 37th Class pennant to the Officer Commanding the Fort. Later a deactivated Number 4 Lee Enfield .303 rifle (the weapon carried by the cadets in 1963) will be presented to the authorities of Arlington National Cemetery. Brig Gen James Kelly R.I.P. ARCO regrets to inform its members of the death of Brigadier General James (Jimmy) Kelly, of Broadway Park, Blanchardstown and formerly of Templemore, Co. Tipperary. On 17 November 2013, peacefully, at James Connolly Hospital, Blanchardstown. Beloved husband of the late Aileen and dear father of Aidan, Nuala, Gráinne, Kevin and the late Diarmuid. Sadly missed by his loving family: brothers, sister, grandchildren Conor, Leo and Milo, son-in-law David, daughter-in-law Heather, brother-in-law, sisters-in-law, cousin, nephews, nieces, relatives, neighbours and friends. Removal to St. Brigid’s Church, Church Avenue, Blanchardstown on Wednesday, 20 November, arriving for Requiem Mass at 10.00 a.m. followed by cremation at Glasnevin Crematorium. Family flowers only please. Donations, if desired, to Our Lady’s Children’s Hospital, Crumlin. On 16 July, 2013, the Department of Defence launched its Green Paper on Defence, which is available on the Department’s website. The aim of the Green Paper is to stimulate debate on Defence Issues and to focus attention on policy issues that the new White Paper should address. The associated consultative process commenced with the launch of the Green Paper, providing the general public and interested bodies with the opportunity of presenting views with the deadline of 10 October. During its meeting of 19 July, the Executive Committee decided that ARCO would make a formal written submission on the White Paper. At a specially convened meeting held on 20 September, the Executive Committee approved the submission, which was submitted to the Department of Defence on 4 October 2013. The submission, which is attached, consists of six parts: Introduction, Political Dimension, Defence and Security Environment, Military Dimension, Resource Dimension and Conclusions. Following an invitation from the Department of Defence, ARCO presented a verbal briefing on its submission during the month of December 2013. The new White Paper will be published in 2014. Brig Gen Pat Daly R.I.P. ARCO regrets to inform its members of the death of Brigadier General Patrick J. (Pat) Daly, formerly of Ballyshannon, Co. Donegal. Peacefully, on 31st October 2013, at his home in his 93rd year. Loving and devoted husband of Pat (née McCarthy) and treasured father of Mary (deceased), Blánaid, Brian, Hugh and Jane. Sadly missed by his wife and best friend of 63 years, sons, daughters, sisters Margaret and Ada, sons-in-law Niall and Martin, daughters-in-law Catherine and Brenda, Jane’s and Hugh’s partners Ber and Mary, his 10 adored grandchildren and 7 great-grandchildren, sisters-in-law, nieces, nephews, relatives, neighbours and friends. Reposing at his home from 4pm on Saturday, Nov. 2nd and from 12pm on Sunday, November 3rd. Funeral Mass on Monday morning, November 4th, at 11am in the Church of Our Mother of Divine Grace, Ballygall Road East, followed by burial in Dardistown Cemetery, Old Swords Road. Family flowers only please.